There's good money to be made in beer apps. Katie Taylor goes in search of a piece of the action. Elon Musk might have the monopoly on techifying transport ideas everyone’s already had, but who’s developing the future of craft beer app technology? While some apps genuinely make our lives easier, there are a lot of apps out there doing things that really, no person ever really needs them to do. 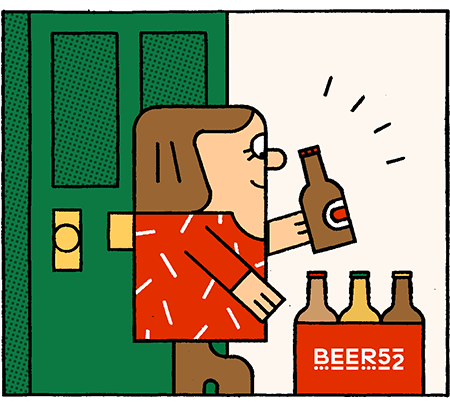 So in a post-Untappd world of endless app-based possibilities, where could beer go next? We had a few ideas. A Skyscanner knockoff. Book plane tickets and citybreaks to up and coming craft beer destinations based on local government planning permission data. Punch in your town or city, desired bedtime and the distance you’re willing to travel for a decent pint and this app will map out your most efficient pub crawl based on your own unique parameters. Downside: this app does not take “danger” or “karaoke” into account. It’s about efficiency, not quality. Push notifications sent direct to your phone about the rare and hyped beers available in your chosen bottle shops if you get there within three minutes of receiving the message. Premium members get a parking permit to download and use in their favourite shop’s delivery bay. Normal brain: What if we could gamify reviewing beers on a social app? Galaxy brain: What if we could gamify reviewing beer REVIEWS on a social app? Flex those portmanteaus and bring a world of purple prose to your pub-going experience, with this app that pits reviewer against reviewer in a battle of the sentences. Forget the beer – this app is about creating the best short synopses and rating fellow reviewers on a range of skills from accuracy to readability, with bonus badges earned for alliteration, poignancy, rage and absurdity. A comparison app that looks at the most hyped, fastest-selling beers that month and offers readily-available alternatives in your area that could already be staring you in the face. Pro: Makes it easier to find great beers by local breweries or discover a classic you might have overlooked. Con: You might find out your favourite beer tastes a lot like Hobgoblin.